There could be several reasons you may wanna change tab image or name. However most possible reason is that the default name and image doesn't comply with tabs functionality. Absolutely, the application developer has no idea what you gonna do with that application on your fan page. Therefore they just leave best possible name as default and let you change it as you preferred. If the tab, actually developer, allows you to change default image and name, it's really a easy procedure. But still you couldn't figure it out. Right? Don't worry, let's find it out and at last you will say how easy it was. 1. Log in to your Facebook account and navigate to your Facebook page. 2. Click on Admin Panel button on top. 3. Click Manage drop down button. 4. Click on Edit Page from the drop down menu. 5. Jump to Apps tab. 6. Find relevant tab application and click Edit Settings link beneath it. 7. Now if the application allows you to have custom image or name for your tab, you will see Custom Tab Image and Custom Tab Name options on the pop up box. Enter your preferred tab name in Custom Tab Name field on the pop up box and Save it. If you wanna change tab image, click Change link next to Custom Tab Image option and upload your own image. 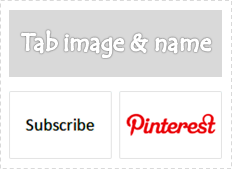 Note: When you upload an image for your custom tab, you can upload a GIF, PNG or JPG image. However to be compatible with tab size, use image dimensions - width 111 pixels and height 74 pixels. Else it will resize your image to that optimal dimensions. However the image file size limit is 5 MB. 8. Now click Okay button on the pop up box and click View Page button to head back to your page. the article would be useful if i actually could see the 'custom tab image' and 'name' option. can you understand why that would be?